Mailigen added a new Magento list synchronisation extension to their email marketing platform. With the integration Mailigen email lists and Magento email newsletter subscriber lists can be automatically synchronized two-way. Magento is currently the largest open source e-commerce software provider and is used by aproccimently 26 % of online retailers worldwide. •	Automatic synchronization between Magento email subscriber list and a Mailigen email lists. 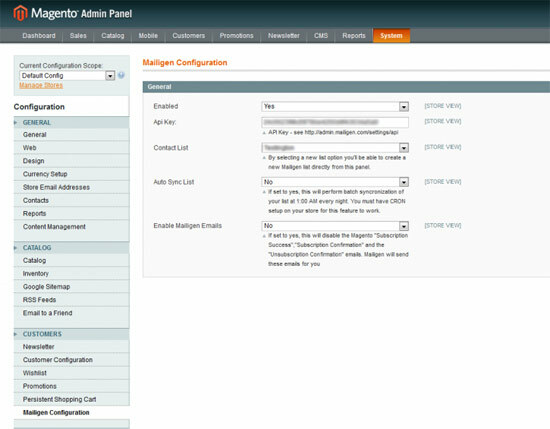 When users subscribe to the newsletter in Magento, they will be added to the selected Mailigen contact list. •	Two-way synchronization when it comes to subscriber status change. When users unsubscribe from the Magento list, they will be removed also from Mailigen lists and vice versa, users will be removed from your Magento list when unsubscribed from your Mailigen list. Although not a full-fledged integration, the list synchronisation will certainly be appreciated by all users currently working with the Mailigen and Magento combination. Mailigen has seen e-commerce email marketing as a priority. They also recently launched an integration with e-commerce retail solution Shopify. A integration is currently developped for Salesforce. The extension is free of charge to all Mailigen customers. Mailigen is a web-based easy to use integrated marketing software offering email, social & mobile marketing for any size business.